Surrounded by South Africa, except for a short border with Mozambique, Swaziland depends heavily on South Africa for more than 90% of its imports and for 60% of its exports. Swaziland's currency is pegged to the South African rand, effectively relinquishing Swaziland's monetary policy to South Africa. The government is heavily dependent on customs duties from the Southern African Customs Union, and worker remittances from South Africa supplement domestically earned income. 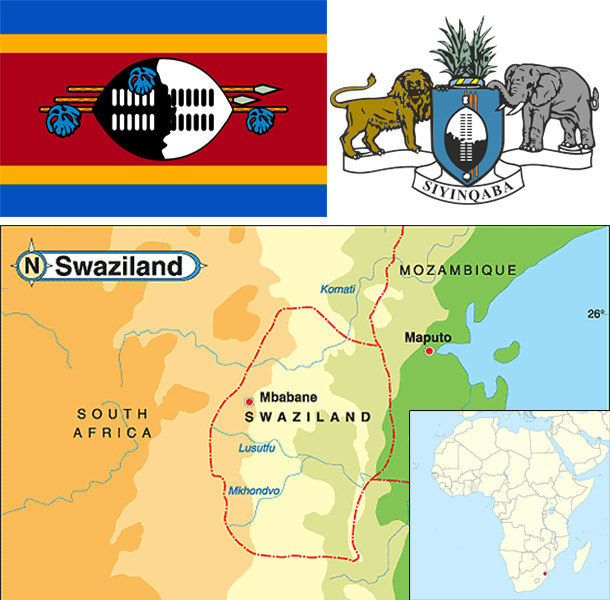 Swaziland’s GDP per capita makes it a lower middle income country, but its income distribution is highly skewed, with an estimated 20% of the population controlling 80% of the nation’s wealth. Subsistence agriculture employs approximately 70% of the population. The manufacturing sector diversified in the 1980s and 1990s, but manufacturing has grown little in the last decade. Sugar and wood pulp had been major foreign exchange earners until the wood pulp producer closed in January 2010, and sugar is now the main export earner. Mining has declined in importance in recent years. Coal, gold, diamond, and quarry stone mines are small-scale, and the only iron ore mine closed in 2014. With an estimated 40% unemployment rate, Swaziland's need to increase the number and size of small and medium enterprises and to attract foreign direct investment is acute. Overgrazing, soil depletion, drought, and floods are persistent problems. On 1 January 2015, Swaziland lost its eligibility for benefits under the African Growth and Opportunity Act (AGOA), threatening the remaining 12,000 jobs in the textile and apparel sector, after 3,000 jobs were lost since the 2014 announcement of the loss of AGOA. As of 2013 more than one-quarter of the adult population was infected by HIV/AIDS; Swaziland has the world’s highest HIV prevalence rate.